Part I: The Principles 1.1: Principles of Sustainable Engineering (M.A. Abraham). 1.2: The Twelve Principles of Green Engineering as a Foundation for Sustainability (P.T. Anastas, J.B. Zimmerman). 1.3: Ethics of green engineering (P. Aarne Vesilind et al.). 1.4: Green engineering education (R.P. Hesketh et al.). Part II: Developing the Principles 2.1 Systems Thinking (W. Olson). 2.2 Systems and Ecosystems (J. A. Russell et al.). 2.3 Life Cycle Based Sustainability Metrics (G.A. Keoleian, D.V. Spitzley). 2.4 Making Safer Chemicals (K. Geiser). 2.5 Renewable feedstocks (L. Moens). 2.6 When is waste not a waste? (J.B. Zimmerman, P.T. Anastas). 2.7 Socially constructed reality and its impact on technically-trained professionals (P. Melhus). 2.8 Be creative: Develop engineering solutions beyond current or dominant technologies, and improve, innovate, and invent technologies to achieve sustainability (H.M. Cothron). 2.9 Actively Engage Communities and Stakeholders in the Development of Engineering Solutions (L.G. Heine, M.L. Willard). Part III: Applying the Principles 3.1 Utilizing Green Engineering Concepts in Industrial Conceptual Process Synthesis (R.M. Councea, S.A. Morton III). 3.2 Clean chemical processing: Cleaner production and waste (K.L. Mulholland). 3.3 Role of Chemical Reaction Engineering in Sustainable Process Development (C. Tunca et al.). 3.4 Green engineering and nanotechnology (B.J. Yates, D.D. Dionysiou). 3.5 Technology Assessment for a More Sustainable Enterprise: The GSK experience (D.J.C. Constable, 3.6 Engineering Sustainable Facilities (J.A. Vanegas et al.). 3.7 Engineering Sustainable Urban Infrastructure (A. Ramaswami). 3.8 Implementing The San Destin Green Engineering Principles in The Automotive Industry (M. Sibel Bulay Koyluoglu, S.L. Landes). 3.9 Infusing Sustainability in Small- and Medium-Sized Enterprises (B. Bras). 3.10 Sustainable Design Engineering and Science: Selected Challenges and Case Studies (S.J. Skerlos et al.). Sustainable development is commonly defined as "development that meets the needs of the present without compromising the ability of future generations to meet their own needs." Sustainability in engineering incorporates ethical and social issues into the design of products and processes that will be used to benefit society as a whole. 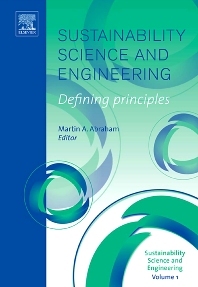 Sustainability Science and Engineering, Volume 1: Defining Principles sets out a series of "Sustainable Engineering Principles" that will help engineers design products and services to meet societal needs with minimal impact on the global ecosystem. Using specific examples and illustrations, the authors cleverly demonstrate opportunities for sustainable engineering, providing readers with valuable insight to applying these principles. This book is ideal for technical and non-technical readers looking to enhance their understanding of the impact of sustainability in a technical society.